optimized allocation and integration of the inputs needed to meet those pre­defined objectives. meet the objectives established by the organization. Efficiency: In order to be efficient, management is concerned with minimizing resource costs. Efficiency is "doing things right". completed. Effectiveness is "doing right things". yet not effective? Yes, by doing wrong things well. 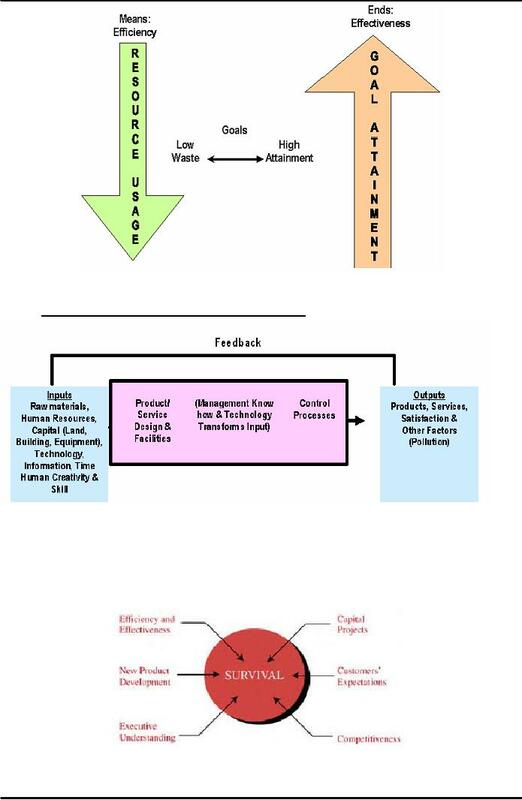 The following figure (figure 3.1) shows management seeking efficiency and effectiveness. that survival of the firm is at stake, the implementation of project management becomes easier. often based upon how important they perceive the driving forces to be. well as use more systematic management skills. start to finish and should have the ability to ensure that this vision is realized. organization's basic goods or services. Staff managers use special technical expertise to advise and support the efforts of line workers. production, personnel, accounting, or sales. An administrator is someone who administers work in any kind of organization. managing conflict, staffing, and training. 4. Networking: It includes socializing, and interacting with outsiders. the role of the Project Managers is also witnessing rapid changes. as one climbs the managerial ladder. brief incidents or episodes. Activity rates tend to decrease as rank increases. spend proportionately more time outside their work areas and organizations. time communicating verbally by personal contacts/ telephone etc. superiors, peers, subordinates, and outsiders on ongoing basis. find uninterrupted blocks of time for reflective planning. most of their time obtaining, interpreting, and giving information. time spent on meetings as well as on informal discussions. feel secure and free to express their opinions. elements in a situation, and to understand relationships among elements. Design Skill is the ability to solve problems in ways that will benefit enterprise. Average company will be smaller, employing fewer people. Traditional organizational structures will become more team-based and without boundaries. Employees will be empowered to make decisions. Flatter organizations will be the norm. Work will be organized around teams and processes. Bases of power will change. Stress will be on vision and values. Managers will be change agents. Leadership will be more important.